I like it when I get in to see my prefered doctor. No, I don’t mind paying the full $70 up front, then claiming $33.55 or whatever the going rate is from Medicare. I don’t really even mind that she runs late and that, like today, sometimes it’s by an hour. She didn’t even ask me this time when I was planning on popping out kids (probably saving it for the pap test in November)… though she did warn that H1N1 could have effects on foetuses, whether you know you’re pregnant or not. So, I wandered off to the pathology place around the corner from the Dr’s to get the blood out (no, not for a pregnancy test, for iron and all that to make sure my body’s gotten it’s act together on absorbing the protein I eat and isn’t neglecting anything in the process). I was asked if I’d had a blood test before, and I replied “Yes, and everything went black”. The nurse suggested that I perhaps should lie down for it. And what do you know, it worked, and nothing went black. She did only take 3 vials, and last time it was 5 on an overnight fast but still. Maybe one of these days I’ll get the courage up to give blood again? There’s yummy sushi at Manuka. I think it was Mee’s sushi? Soft yummy salmon! I bought it for an early lunch while I sat in the sun until my approximate appointment time. $11.70, including a 350mL diet coke and two soy sauce fish. 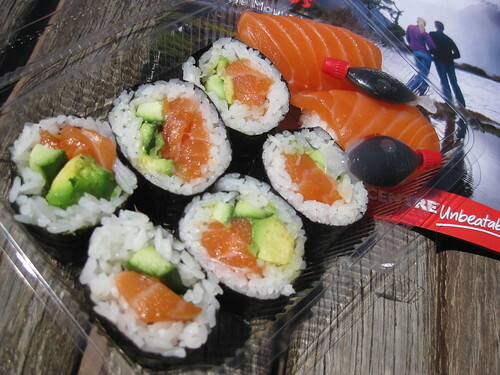 Mee’s Sushi is really yummy! It gets packed at lunchtimes so that’s a fairly good sign.